Also Recommended: I wouldn't recommend anything like this to my worst enemy. Notes: This was the reviewer's first review for THEM, back in 1998. In a far-off planet named Jerra, many years in the future, a catastrophic war nearly destroys all civilization, leaving only ragged bands of weary survivors to fight over the remaining scraps of society. Orbiting space is a capsule containing a single man, M.D. Geist, who was bioengineered to be the ultimate warrior, but was exiled because he was simply too dangerous to be left on Jerra. Of course, the government never figured that one day, that capsule would fall back down on the planet ... but has Geist returned as a savior or a destroyer? As a responsible clerk of a local video store, I have taken it upon myself to view each and every anime title that we have for rent for the fans who frequent the store. M.D. Geist, however, was such an utter waste of time that I began to reconsider my well-intentioned policy. Simply put, the main character of M.D. Geist (the M.D., by the way, stands for "Most Dangerous" ... how's that for cheesy?) is psychopathic, homicidal, insane, misogynistic, and worst of all, has a penchant for lines that would make Schwarzenegger look like a member of MENSA. (Classic Schwarzenegger at that.) Any characters who are remotely likable are killed off almost instantly (usually rather gruesomely as well). The animation quality isn't great even compared to 1980s standards, while the plot at best is razor-thin, with very little sense of logic (or actual coherent thought, for that matter). 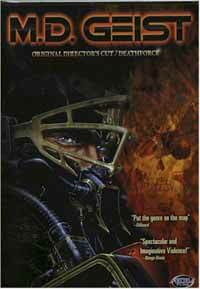 The most remarkable thing about this title, apart from a few mildly interesting mecha (yawn) is the sheer amount of gratuitous violence. Body parts fly everywhere in M.D. Geist's path. (Honestly, I kept hoping that Geist himself would get axed, but alas, it was not to be.) And the ending is simply deplorable. Simply put, M.D. Geist is bad AND ugly. Unless you watch anime for the express purpose of watching shameless amounts of gore and blood dashed across your screen, stay well away from M.D. Geist. You'll be glad you did. Recommended Audience: Plenty of body parts and heads being severed. There is also an attempted seduction (which falls completely flat). The only people who like this stuff would be the teens who shouldn't be watching it. Not that anyone should be.